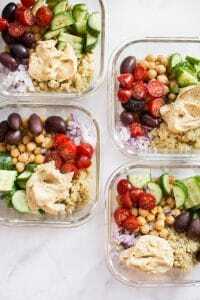 These Mediterranean vegan meal prep bowls are filled with healthy, fresh ingredients that include protein and good fats. These bowls are ready in under half an hour! Meanwhile, prep your other ingredients and divide them equally between the 4 bowls. Once the quinoa has cooled, add it to each bowl. Optional: drizzle a bit of olive oil and squeeze some lemon juice over each bowl. Feel free to swap the quinoa with rice or Greek potatoes (or whatever you wish! ).